This is part three of our four part series: Pipedrive's Big Sales Interview. (You can catch up on part two and part one). Max Altschuler, the founder of Sales Hacker, is literally writing the book on millennials in the sales workforce. His newest book Career Hacking for Millennials is due out next March. Altschuler, whose first book, Hacking Sales: The Playbook for Building a High-Velocity Sales Machine, was published in 2015, is a millennial himself. He bears many of the hallmarks of that generation’s workforce: he’s a serial entrepreneur, he’s not afraid to leave a job when he’s done with it, and he’s driven by his passions (a portion of the proceeds from Hacking Sales support Muttville Senior Dog Rescue). So it’s no surprise that Altschuler, the latest subject of Pipedrive’s Big Sales Interview, has a lot to say about his generation, and other generations’ misconceptions about millennials. The Big Sales Interview is an in-depth discussion with a thought leader in the sales industry. These conversations go beyond each thought leader’s latest book or sales philosophy. Altschuler spoke to us about his personal history in sales and entrepreneurship, the lessons he’s learned as an entrepreneur, and the ways sales organizations can keep their millennial workers happy and productive. Who are you and what are you known for in sales? 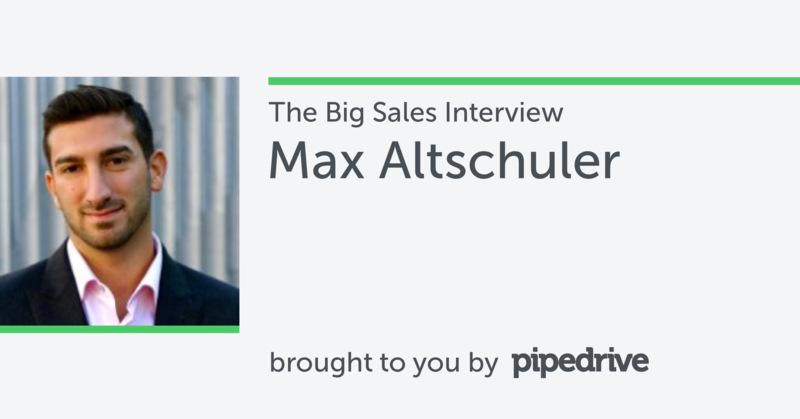 I am Max Altschuler, and I run a media company and publication that allows practitioners to have a voice and help other practitioners build up their sales processes and sales teams. We're trying to build the next generation sales force, a modern sales force, and we're doing that by allowing practitioners to talk about what they're doing that's unique. In summary, we're trying to build the largest community of salespeople backed by budgets. Because those are the salespeople that are actually going to be forward-thinking and have companies behind them that invest in recruiting, training, and technology to support their reps and teams. How did you get into sales? I've always been an entrepreneur — ever since I was a little kid on the school bus selling my Halloween candy, up until I worked with my dad who's a financial advisor and runs his own practice, all the way up to starting two companies out of college — and a big piece of being an entrepreneur is knowing how to sell. What was your first sales job, and what did you learn from it? I got my start at a company called Udemy, an education marketplace where I built the sales side and the original process there, took them through their seed A and B rounds of funding, and then started Sales Hacker. Salesperson is a laden term. When did you first 'own' that label? I've always been an entrepreneur, I've always been in sales, but we've always come up with a different name for it in terms of whatever it was that we were selling. When I was at Udemy we were onboarding instructors and creating an online course was a very heavyweight activity. We were dealing with these big publishers who were our enterprise partnerships, and they weren't used to that. So getting these people to do something for the first time for us was harder and you had to build trust. Therefore we used Instructor Onboarding Specialist or I was a Partnership Specialist. The act is selling, yes, but we definitely stay away from that word because with the people that we're selling to, we want to create a psychological effect before they have a conversation with us: that they're in the right hands and are in it for a long-term partnership, not just a one-time sell. So yeah, I've owned being a salesperson, but I usually play with the label if I can. How do you define ‘salesperson’? Somebody who's really good at prescribing and diagnosing based on the best case scenario for both parties. Someone who can ask the right questions, take those answers, and formulate that prescription in a manner that is organized, concise, and prompt. Someone who’s honest, meaning if it's not the right fit, they don't push it forward. Sales should be seen as partnerships, as valuable relationships. When you look back on your early career, what one thing would you have done differently? I would have taken psychology as my major in college instead of architecture, because that is something that is necessary in entrepreneurship and sales. And then I probably would have tried to get involved more in some strictly cold-calling, inside sales jobs when I was in college. At a lot of startups now, sales positions are much cushier than some of those old-school boiler room-style cold-calling facilities. I'm not saying that's where you should go work, but I wish I could see what some of these old-school folks went through, and how they did it, and to be able to adopt some of those practices. Cold-calling is a very, very valuable skill. Whether it's still the go-to or not, it's definitely still an important part of selling. Just understanding how to talk to people that you never met before is a very valuable skill. I think you have to see that to appreciate some of these new sales organizations and how they're set up, and some of the technology that's available today. If you learn the hardest thing first, everything gets easier, so if you learn how to be a successful cold caller, then everything else in sales gets easier. How did you develop Sales Hacker? I started a Sales Hacker meetup that was invite only — we only brought in people that added value — and we were doing some really hacky stuff in sales. This was in 2012 or 2013. The group got growing, and when I left the company that I was with after Udemy, I didn't know what I wanted to do next. We'd been running this meetup for about 10 months, and it was pretty big, and we had some amazing names in there, like Jason Lemkin from EchoSign, Matt Cameron, who was the VP of worldwide sales from Yammer, and Doug Landis, who was the VP of sales productivity at Box at the time. So I said to the group, "I don't know what I'm going to do next, but who'd be interested if we did a conference?" And in the next day or so I had a really amazing lineup and like 15 paying sponsorships. And I ran the event by myself in four weeks, there was like 60k in profit. I kept going from there and basically said to myself, if I do this for a year, I'll have a really good network. And while I'm doing it I can figure out what I can go build, if I want to be a founder somewhere, if I want to go be a VP of sales somewhere. I didn't know what I wanted to do, but I knew that it would unlock a lot of opportunities. So I just kept going with it and now it's definitely become a pretty big business. Every year there are new partnership opportunities, new expansion opportunities. Just really good things keep opening up for us because we're growing, and this is the first year I'm really putting a lot of money back into the business and hiring a core leadership team. I'm really excited about where we're at right now. I don't know where we're going, but if we just build the largest database of salespeople backed by budget, then we'll be valuable. As long as we have that database, we can be a resource that all these vendors go to to get in front of their target audience. What is your greatest accomplishment in sales to date? Writing the book Hacking Sales and getting it published by a real publisher, Wiley, that was kind of like full circle for me. Wiley was one of the big deals I did with Udemy. They were one of my big partnerships; I got them on the Udemy platform. At that point I was this young entrepreneur, a sales guy at an up and coming startup, and I was reaching out to them, being super persistent, trying to get them to put their content on Udemy, and they finally did. They were our second big publisher. But the funny thing about writing a book was having Wiley come knocking to publish it. And now I have a book published and I can walk into the 5th Avenue Barnes and Noble in New York City and see it up on the wall, or go into the Hong Kong airport and see it next to Jack Ma's book Alibaba. It’s come full circle in such a short amount of time, like less than five years. What skills have you honed in sales that you use in your everyday life? Negotiation. Mainly negotiation, then understanding how to create a win-win situation. I think the number one thing that sales has taught me is, you need to build trust with people, and if people trust you they'll work with you. And so it's all about building a reputation for yourself. You're seeing a lot of people now build social media presences and brands and commercial brands and things like that online, and that's all good. What you really need to build is a reputation where people trust you, and if you can do that, people will do what you want them to do without having to ask. I think that level of trust — that no matter what is happening in a conversation, you're focused on making sure you're doing the right thing for them and not just yourself, is the most important thing that sales has taught me in all my relationships. What does the sales industry need more of? People who understand the long-term. I think most people are very short-sighted, and do very short-sighted things. They trash-talk competitors, not understanding that in five years they could end up looking for a job at a great company, and the one person who needs to sign off on it just happened to be the VP at that competing company at the time. It's like, "Oh, I remember that guy, he talked-trash about us like five years ago at that other company. No, I don't want to hire him. He doesn't do things the right way." What’s the most misguided philosophy (or practice) in sales today? Don't be like an alligator: small ears, big mouth. You want to listen more than you talk, basically. It's more important for you to be asking questions than it is for you to be talking the entire time. And I think a lot of people get that wrong in sales, they think, in sales, they need to be the one talking. I hear salespeople all the time that can't shut up. They just continue and keep going and going and going. And they're blowing it, because they didn't ask the right questions. They're not answering my needs and my problems, they're basically rambling and talking about what they think I have a problem with, and that doesn't work. What book or website do you think everyone in sales should read, and why? I would recommend everyone read 48 Laws of Power by Robert Greene, because I've probably used a lot of those in my everyday life. You’ve spoken about the role of tech in sales, but have said that salespeople are unlikely to be replaced by technology. How do you think technology will change the job of sales reps in the future? Technology supports reps. I don't think it replaces them. It supports and enhances their abilities. I'm really interested in technology that's supporting and helping buyers, because I think not a lot of people are working on that side of the house. I feel like that’s going to be a much quicker adoption, but it's going to be long tail, so it's going to be real slow for a really long time, and then one day people are going to feel like a switch has been flipped. Right now there’s a lot of technology helping the sales side, helping the sales person sell better. And that’s great; that’s helping right now. But I think in the future you'll start to see buyers with so much information that they're not going to be buying the same way that they're buying right now. They're going to be listening to their peers more, they're going to have access to information deeper down into the sales process, and what buyers will likely need is more of a sales engineer that's going to help with implementation than a salesperson to convince them. You’ve spoken about millennials in the workforce, and you’re a pretty good example of a millennial yourself — you’re an entrepreneur, a remote worker, and have started a charity to benefit something you’re passionate about. How should sales organizations be supporting their millennials? Anybody who is hiring millennials and then treating them like anyone else from any other generation that came before them is probably a failed sales organization or salesperson, because you wouldn't do that to every customer you deal with. Every persona should be treated differently. I feel like the millennials are coming in and saying, "Well, this is how we like it." And the companies that get it right are the ones that are attracting them and the talent that comes with it, and the ones that get it wrong are saying, "No, they have to do it this way. They have to come in and learn this thing." It's fine if millennials have to learn. But if you're not meeting them halfway and making it easier for them and adapting to them, then what kind of sales process are you really running? Where you don't ask those questions. I'm a millennial, I wouldn't want to go work for an organization like that. It's funny, you know, the system was not created by millennials. We went to high school, college, grade school — all these places that weren't created by us — and every year, as long as we got a 70 or better, we went to the next level. Now all of a sudden you get out of college and you don't graduate, you don't get a promotion every year, and it's our problem that the system was set up for the first 25 years of our life like that, and then people are cranky when millennials expect a title promotion every year? Listen, times have changed. You can either resist that and say, "Oh, you're entitled, this isn't the place for you," or you can simply change your sales development organization. You can create different positions that millennials can move up through, and feel like they're achieving something. You will win if you adapt to them, not the other way around. You might think it’s ridiculous that somebody thinks they're going to get promoted every year. Yes, it's ridiculous, but the system was set up to make people think like that for the first 25 years of our life. And then you're going to change it, and you think that that's going to go in your favor? You can easily just adapt your sales development structure to make people motivated, happy, and feel like they're actually going somewhere in their job. It seems a lot easier to do the second than to cry about the first. That's, I guess, my little piece of actionable, practical advice. You’ve called the customer success one of the most underrated parts of the sales process. How should sales organizations change their approach to customer success? It's much easier to retain a customer than it is to get a new one. So if you can obtain and upsell customers, that's a lot cheaper and easier for you to do than it is for you to have to go out, build pipelines, and sell somebody for the first time. It's also one of your best ways to get new customers. So if you have happy existing customers, they're going to tell people about you. They're going to scream it from the rooftops. They're going to go on G2 Crowd and other services and write about it. They're going to do favors for you. They're going to bring people to customer dinners that could potentially buy your product. They'll be your champions and evangelists. There are a lot of resources that need to go into customer success, that I don't think companies are paying attention to at the moment. And it's one of the hardest roles to hire for: a VP of customer success who really knows what they're doing, who really knows how to get ahead of those renewals, knows how to upsell, and knows how to put the pricing packages together to get the most out of these companies. What about sales is still difficult (or scary) for you? I still hate losing a deal just as much as anybody. We've done well, but I still take massive risks, and could bottom out at some point. I do a lot of stuff that scares me every day. I'm running a company right now, I've never done this before, I don't know what I'm doing. Most of the time, the stuff we deal with is completely new to me. But you have a good set of mentors or you approach problems in a similar manner to how you’ve approached them in the past, and you figure it out. You do the best that you can. And that's it.